Lorna invited Emily S, Mandy and I to dinner at Happy Date Bakery and Restaurant to celebrate her birthday in January. She picked a two lobsters combo meal with 3 side dishes. 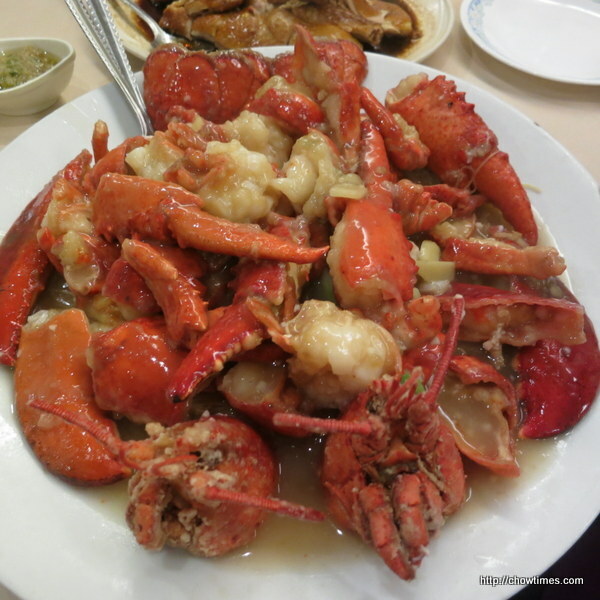 The server recommended green onion and ginger lobster which goes well with a bed of “long life noodle”. Long noodles signify longevity in Chinese culture. 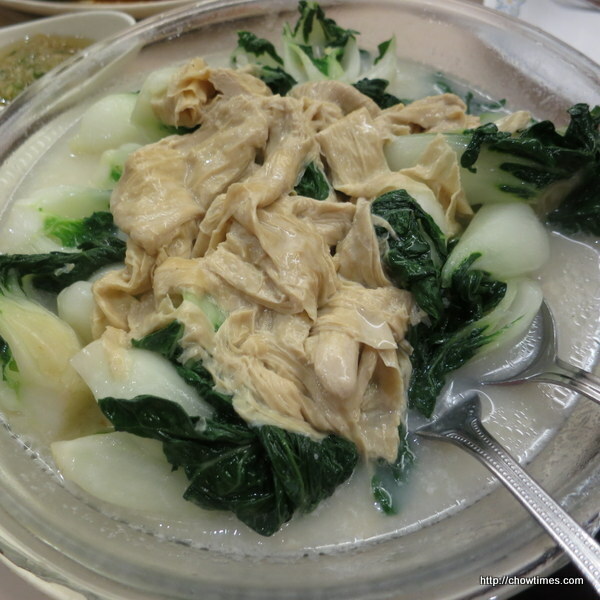 The side dishes which Lorna picked include the above Soy Sauce Chicken which came ginger and green onion sauce. Lorna loves the ginger sauce. Nanzaro went for a hockey game in October. He had dinner at downtown Vancouver before the game. 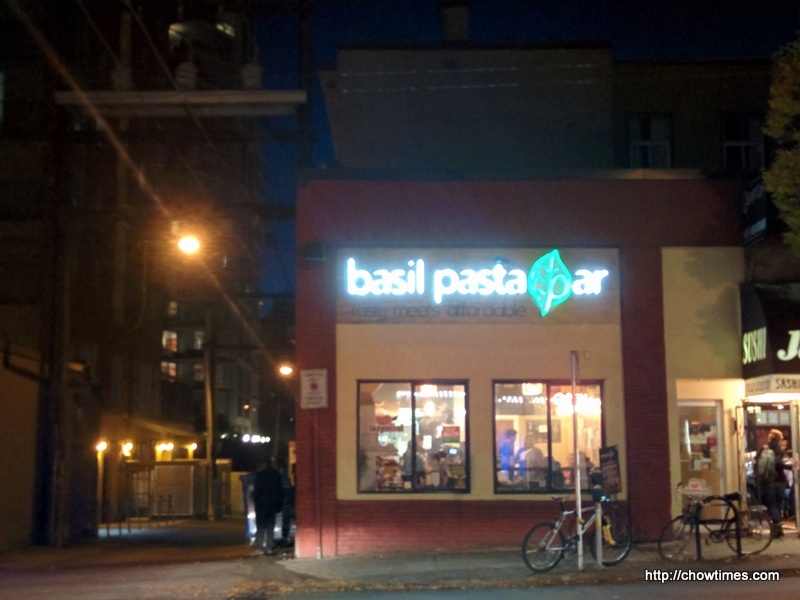 He went to the Basil Pasta Bar on Davie St. 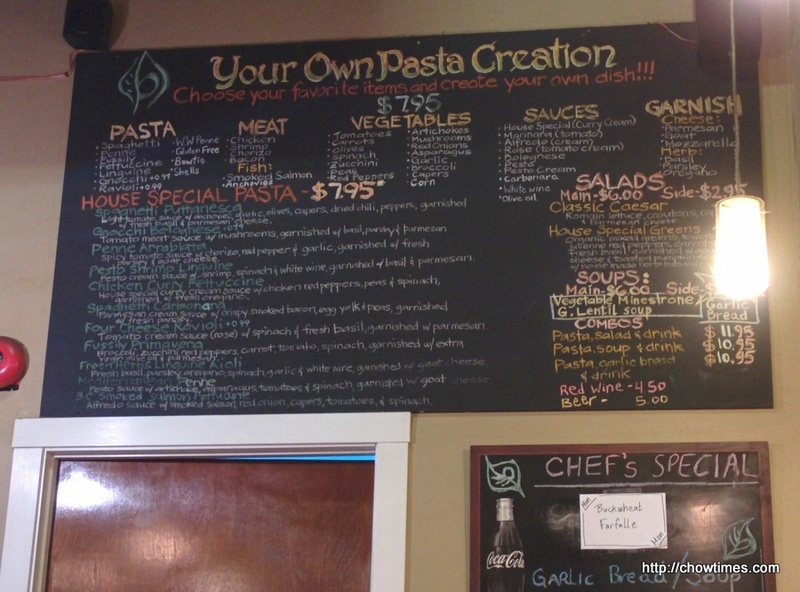 Basil Pasta Bar is restaurant that serves customized pasta. 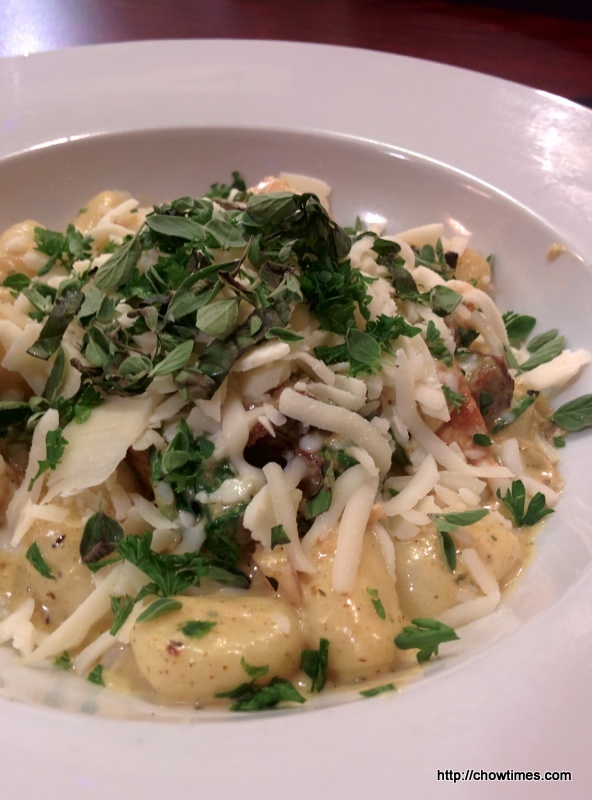 Nanzaro upgraded his pasta to gnocchi for 99cents. He opted for curry cream for the sauce, chicken and Chorizo sausage for the protein and for the veggies, he had spinach, mushrooms, red onions and garlic. For the cheese, he had Parmesan and Mozarrela. As for the herbs, he had all of them which include basil, parsley and oregano. It was quite a big serving. It is certainly a good deal for about CAD$10, according to Nanzaro. 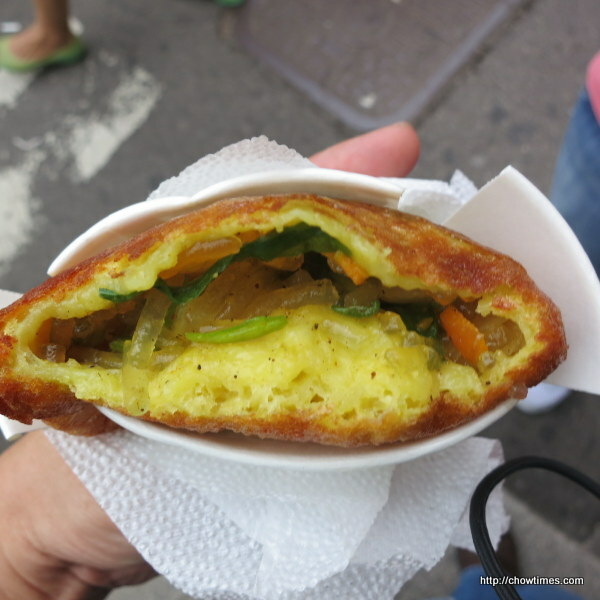 Minoo shared a Lemon Loaf with Poppy Seeds to complete a meal of Caldo Verde and healthy Rice and Spinach Croquettes. 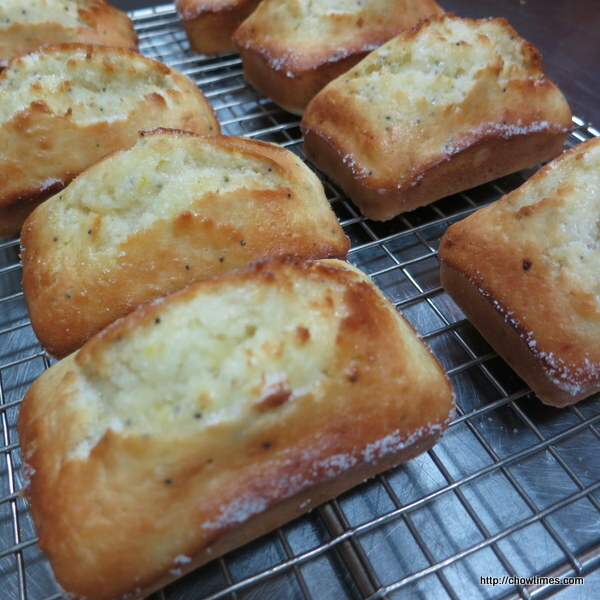 These Lemon Loaf with Poppy Seeds is great for tea break. I am back in the South Arm Multi Cultural Community Kitchen led by Minoo. 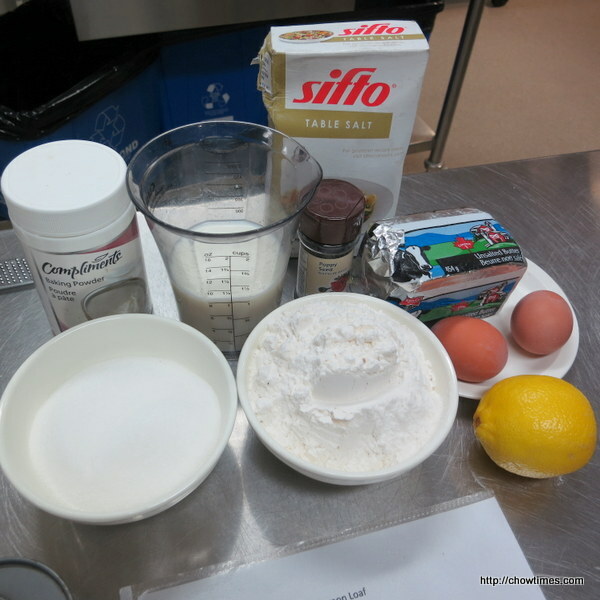 As usual, three recipes were shared in the kitchen. 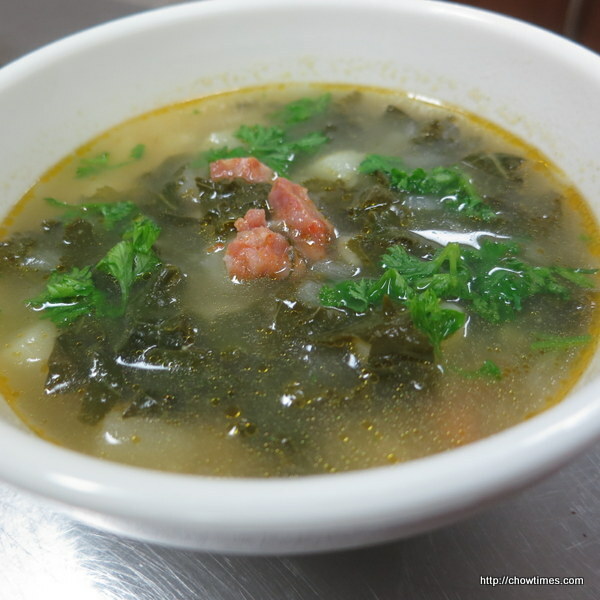 The first recipe was Caldo Verde (Portuguese Kale Soup with Chorizo) which I had blogged before. 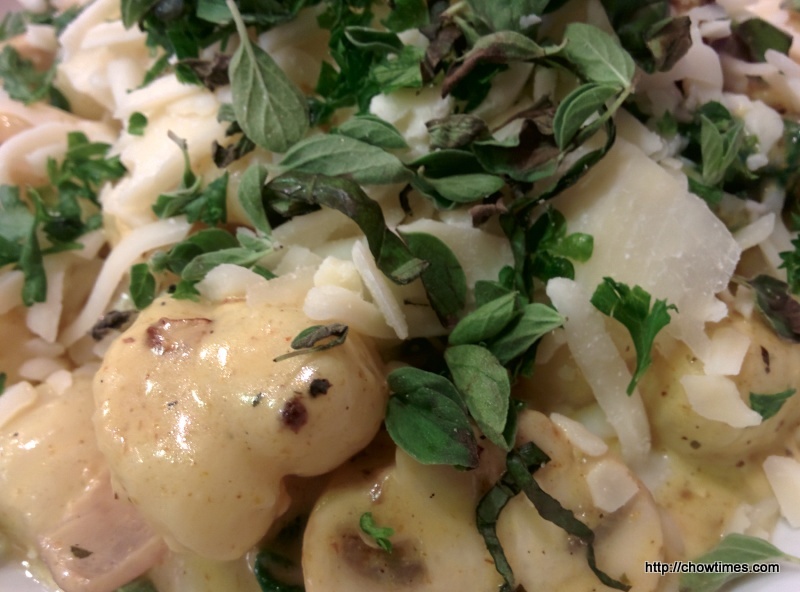 Minoo’s recipe is very similar with the one which I had blogged here, with the addition of fresh parsley. 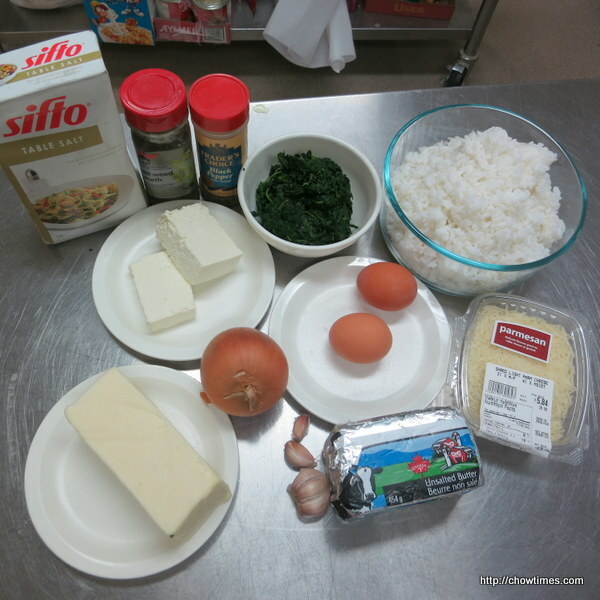 The second recipe is a great way of using leftover rice. 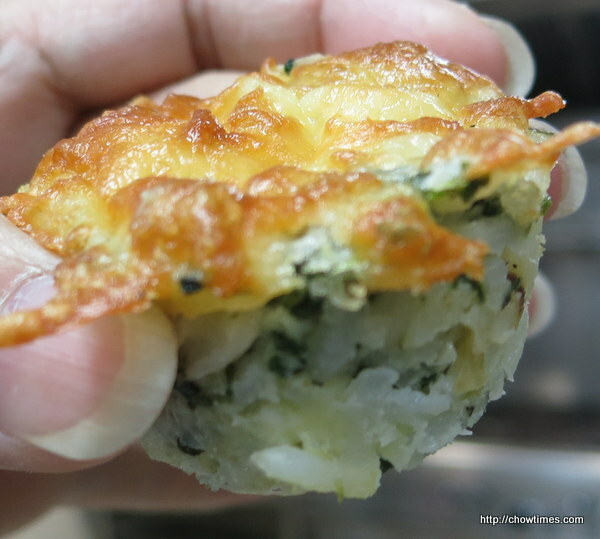 This healthy Rice and Spinach Croquettes makes great snacks for the lunch box. 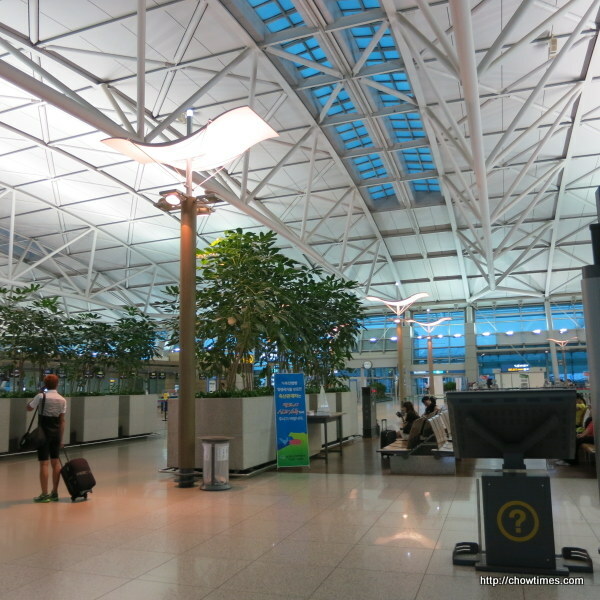 We had an early flight back to Beijing. We woke up at 4:00AM to get ready to the airport. The hotel concierge told us it’s too early to call for a cab. So, we had to walk to the main road to try to catch a cab. Fortunately, we did not have to wait long to get one. 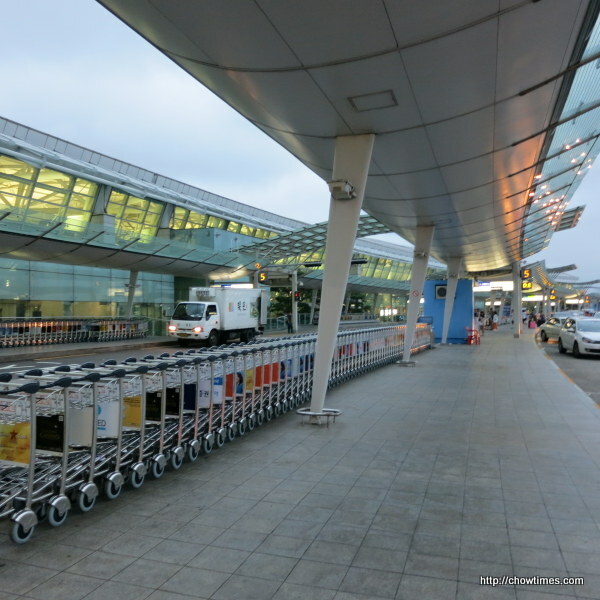 The cab fare was KRW46,000 (about CAD46) which included a toll charge of KRW8,000 (CAD8). The ride took 45 minutes. It is much cheaper to take the subway if it’s not for such an early flight. After stuffing ourselves with pastries from Paris Croissant, we had to skip dinner. But later that night, we felt a little hungry. So, we went to a neighborhood pub to grab a small bite. 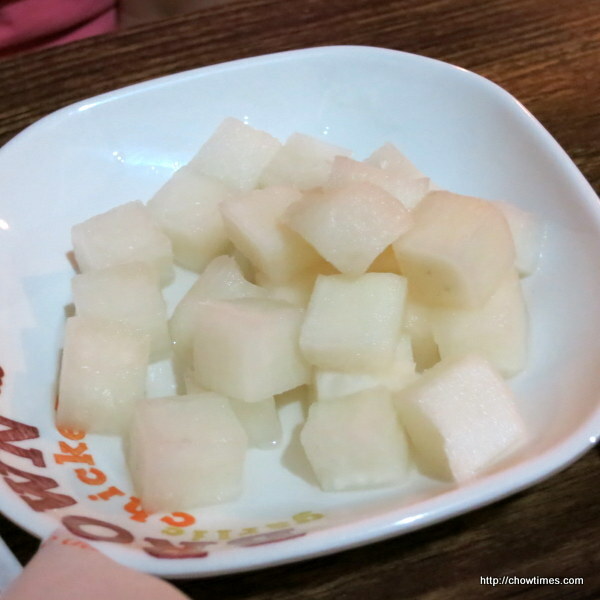 Pickle daikon as a palate cleanser. We had fried chicken for supper. 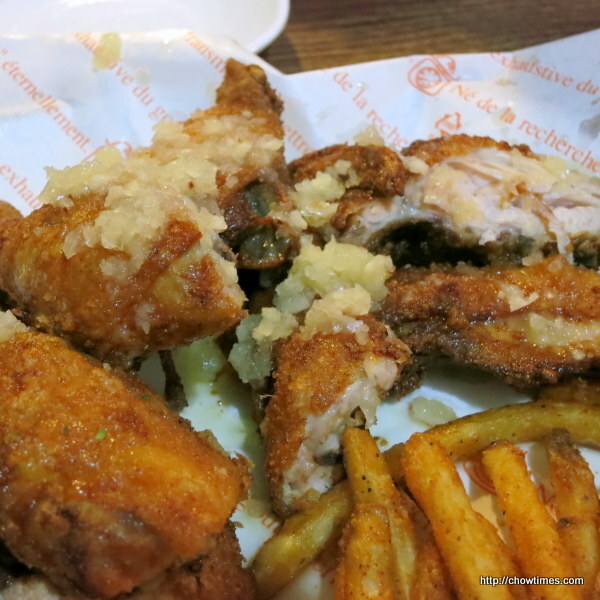 We had two types of fried chicken, regular and garlic flavour. 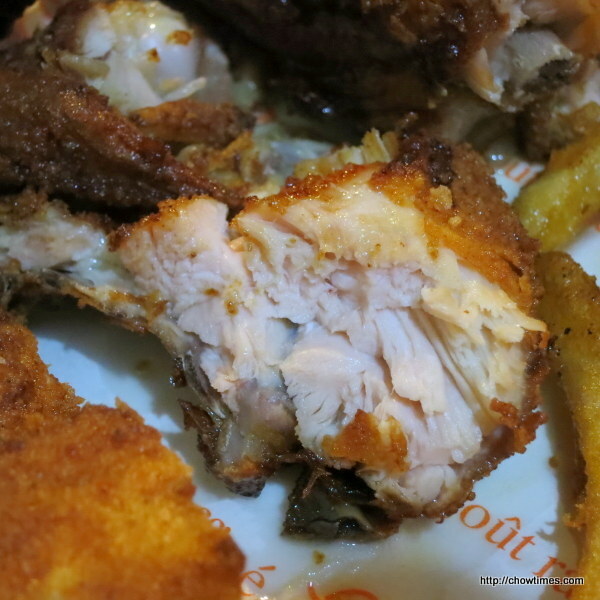 The fried chicken was crispy on the outside and moist inside. Good fried chicken. 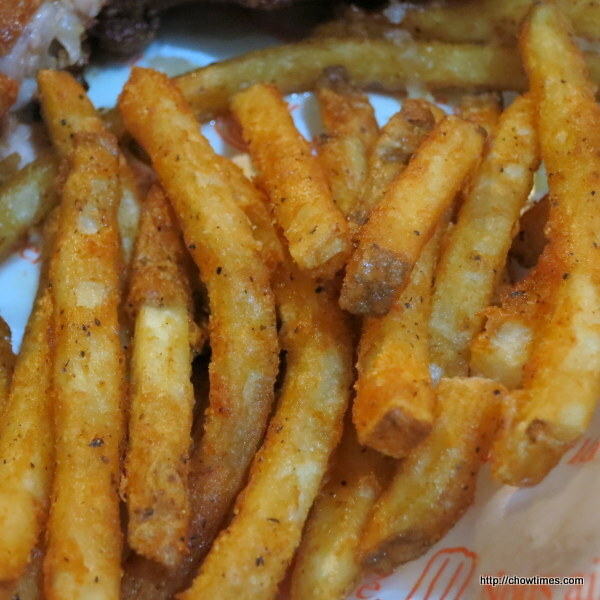 The fries were good too. Ben had a draft beer since this is a pub. 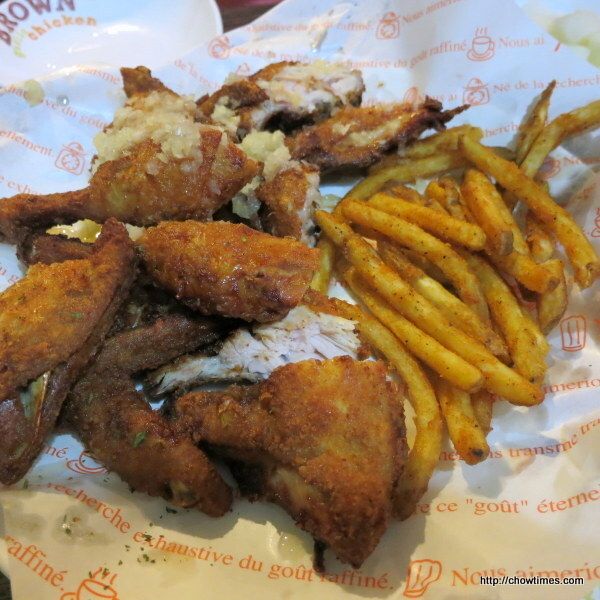 The meal came to KRW19,000 (about CAD19). After lunch, we explored the neighborhood a bit more. 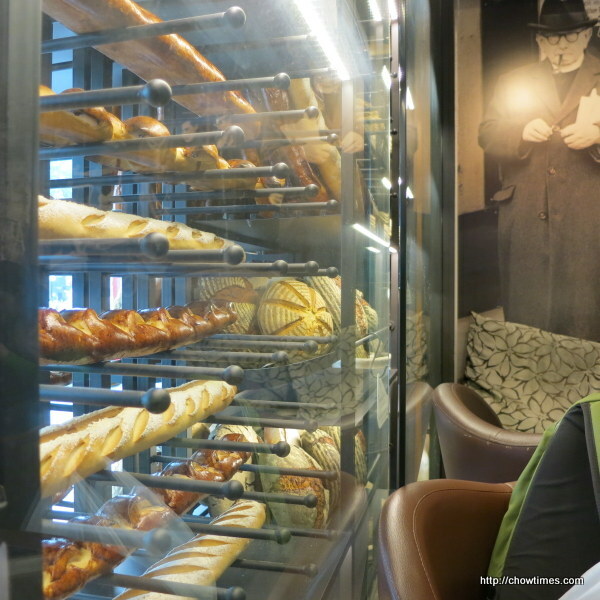 We came upon Paris Croissant, a bakery and cafe. Guess what, it’s tea time. 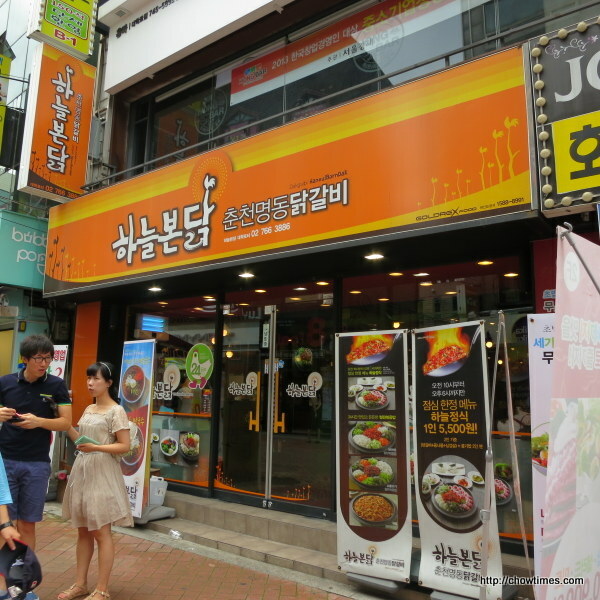 We took the subway to Hyehwa station to look for a traditional restaurant which serves twenty banchans. Unfortunately, we could not find the restaurant. 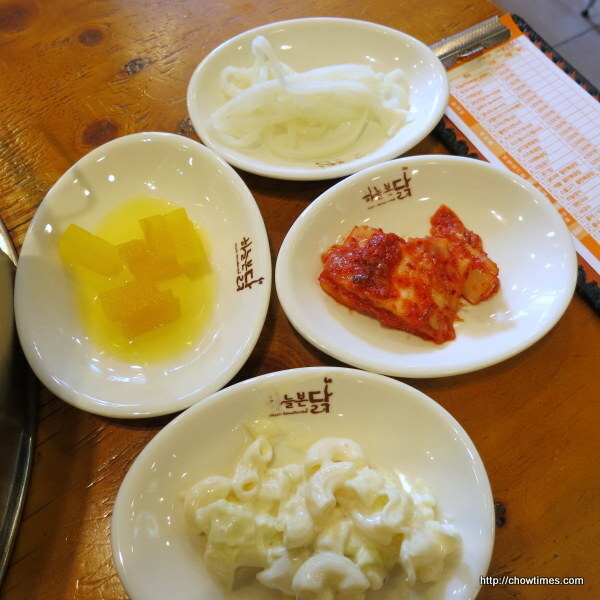 So, we went to Daehangro (University Road) to look for a restaurant for lunch. This street is lined with restaurants with locals patronizing them. So, it must be good. Not so much a tourist trap place. We spent some time exploring a Daiso here. Ben bought a couple of toe socks from Daiso. We then settled with the above restaurant for lunch. As usual, banchans were served. 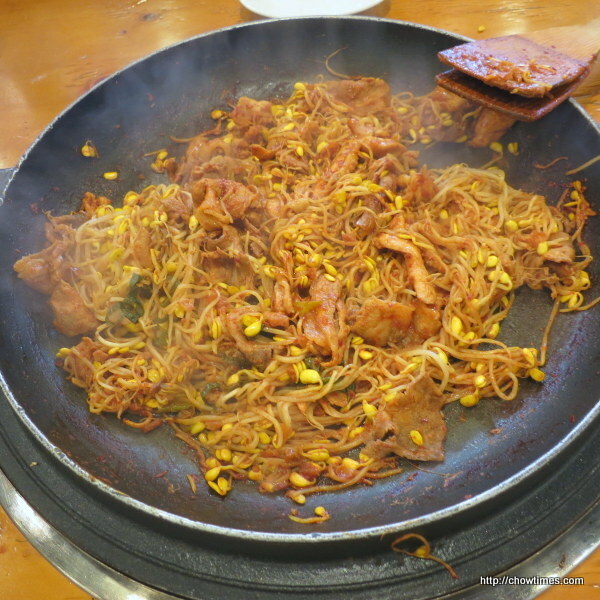 We had the Dakgalbi with chicken and sliced pork. 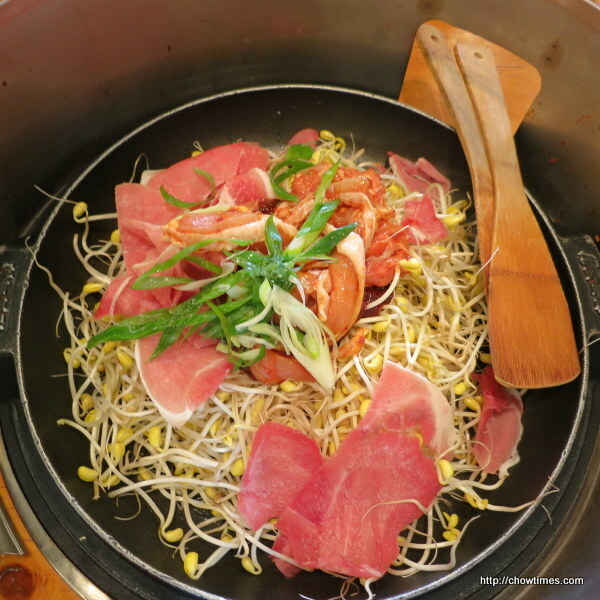 There were a lot of beansprouts lining the bottom. The food was cooked at the table. The server handled the cooking. 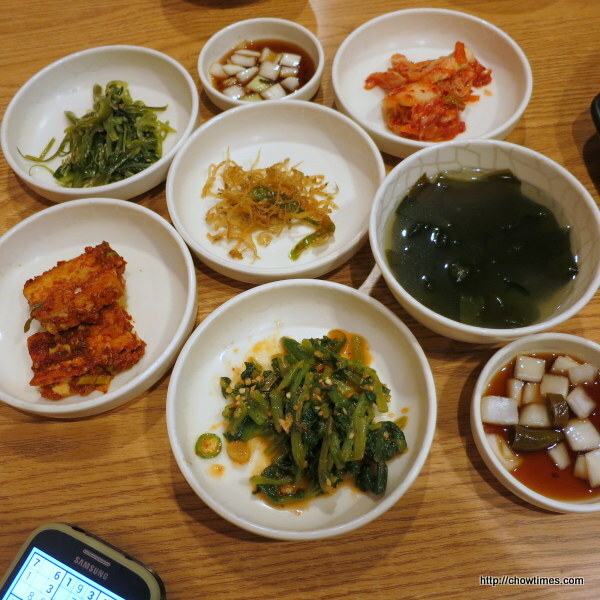 Our meal only cost KRW11,000 (about CAD11). 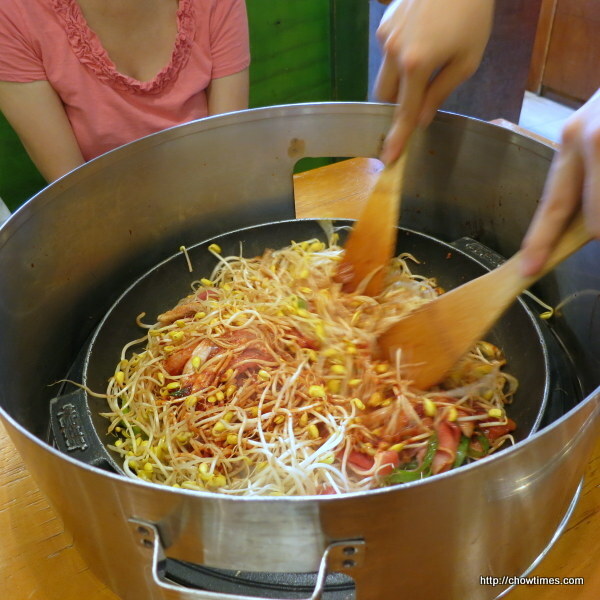 A healthy meal with lots of beansprouts. 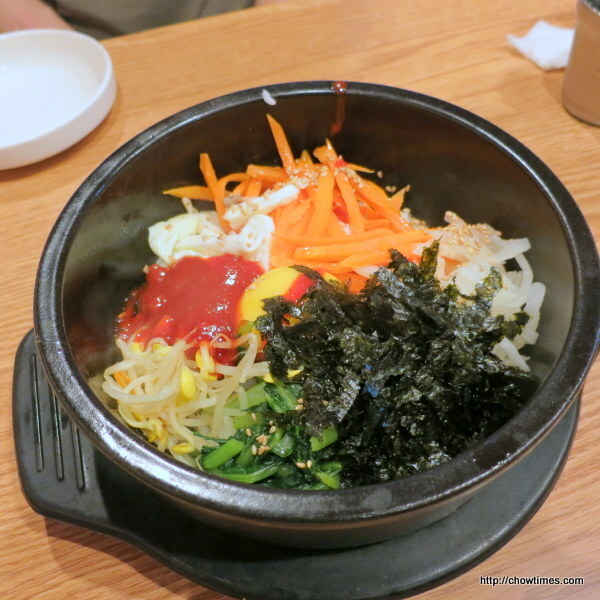 On our last day in Seoul, we revisited Namdaemun Market for more street food. 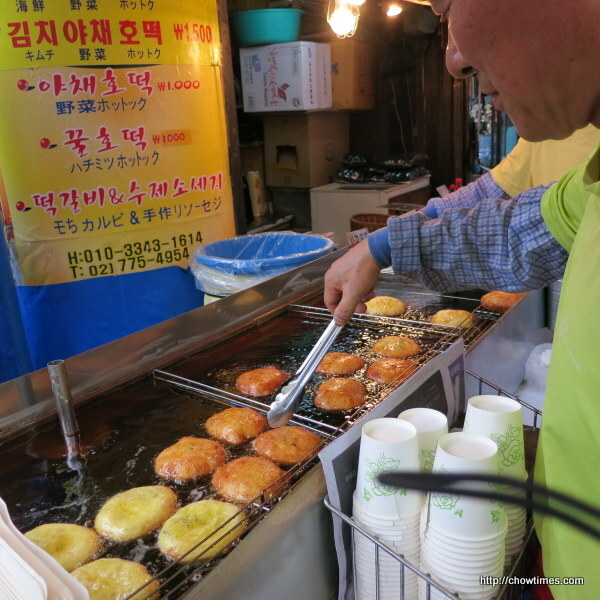 We went to a popular donut stall which we had seen line-up the last time we walked past it. 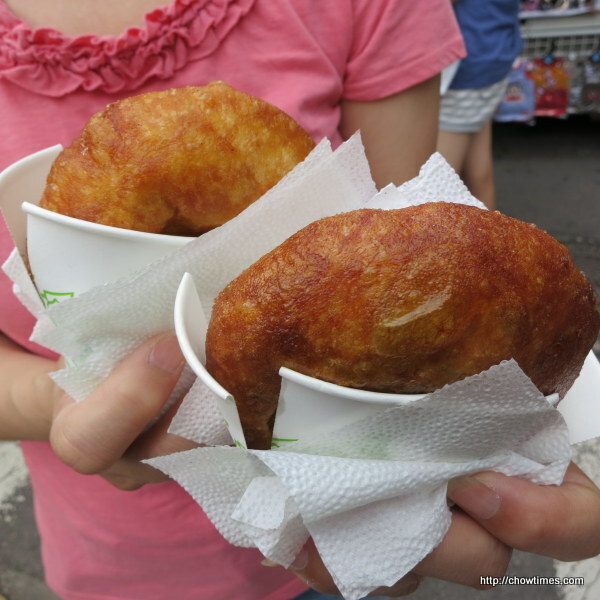 We bought two type of donuts to try. They are just KRW1,000 (about CAD1) each. After the tour of the Secret Garden, we went for a late lunch. This restaurant is awesome. Look at the number of banchans offered. Ben and I shared a Seafood Pancake. 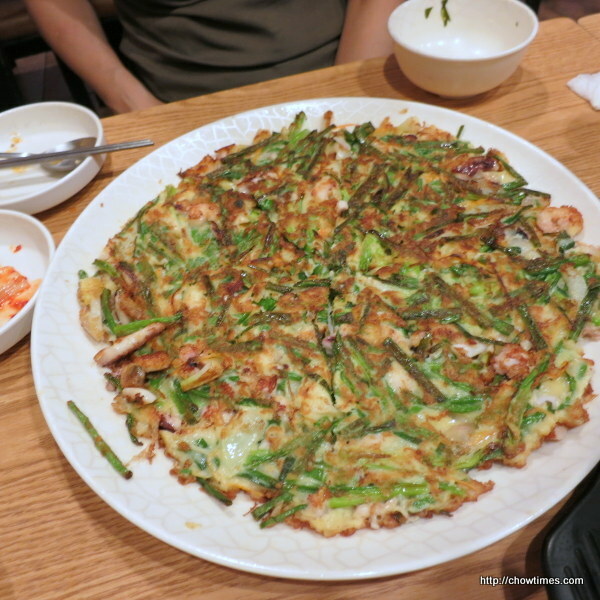 It was fried to crispy on the outside with lots of chives. I love it.